Tom and Maria Leannah are great friends of Israel and great friends of CFOIC Heartland. Their journey has not been simple, but it is one paved by their love of God and His word. Both Tom and Maria grew up in Wisconsin. They met in the early 1970s as young adults working in a department store in downtown Milwaukee. Although both were raised Catholic, neither felt connected to their religion. They eventually moved to Lubbock, Texas and, in the late seventies, had two beautiful daughters Tina, now 38 and Kate, 37. Unfortunately life got complicated for the couple and they separated for a number of years. While the separation was very difficult for the family, it allowed them to reexamine their lives. In the mid1990s Maria began watching Christian television which sparked her interest in God and the Bible. She started taking her daughters, now teenagers, to church. It was their eldest daughter Tina who led Tom to God. While the couple was still separated Tina gifted her dad with a Bible. Tom had never read the Bible from beginning to end and was embarrassed that his daughter was the one teaching him. It was the death of his beloved father in 1998 that Tom says solidified his commitment to his faith. “As I eulogized my father, I compared my life to his and realized I needed to change.” That was when Tom began reevaluating his life through a Biblical lens. For years they looked for a way to bless Israel and then in February of 2007 it happened. Maria explains: “We had been watching Sondra Baras’ Bible teachings on God’s Learning Channel when we were invited to hear her speak at someone’s home. Sondra impressed us with her vast knowledge of the Bible and her explanation of the needs of the people of Judea and Samaria.” The couple have been generously supporting the work of CFOIC Heartland ever since. Over the years they have gone to hear Sondra speak when she came to their community, and have even hosted Sondra in their own home several times. “The Jewish people have to take possession of the land and in order to do that, they must settle,” Tom explains. As Christians the Leannahs see it as their duty to help the people of Judea and Samaria and to encourage fellow Christians to become involved in supporting the settlement movement. In 2009 the Leannahs hosted a dinner to spread this message and expand CFOIC Heartland’s reach. They rented a hall at a nearby hotel and invited friends, family and acquaintances from near and far to learn about Judea and Samaria and support the Jewish people of the Biblical heartland in a practical way. Sondra and CFOIC Heartland U.S. Director, Kim Troup both participated in the event. 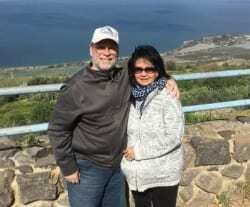 For years, Kim had been encouraging Tom and Maria to join CFOIC Heartland’s annual Israel tour. In 2014 the couple decided that it was time to make their pilgrimage. They felt God’s calling. After years of faithful support, it was time to experience Israel for themselves and see the fruits of their labor. The experience was life-altering. “Our first trip was special” Tom explains. “Just being in Israel is being in God’s presence.” Maria felt the energy even before landing. She recalls the palpable excitement of being on the plane to the holy land with other likeminded people of faith. They recall the satisfaction of seeing the projects that they helped support. That first Israel trip made such an impression that they are now gearing up to come on their third CFOIC Heartland tour in five years. They appreciate that life in Judea and Samaria has not always been easy, but that the people living in the communities are fulfilling God’s promise. They see God’s hand in the miraculous return of the Jewish people to the Land of Israel. The exile and subsequent restoration of the Jewish people in their homeland is something that resonates with them on a more personal level seeing that their personal experience is in some ways reflected in this national ethos. After all, they too experienced a separation and a miraculous reunion that can only be explained as being steered by the hand of God.